16d 31/03/2019 SALE: Margin 0.1 Distance 1400m SOT S RST BM58 Race Maffra Commu. Sports Club-Bm58 Prize $35,000 API 7.64 Race Time 1:25.88 Time Adj +1.28 Sec Time 37.76 Sec Time Adj +2.26 Jockey Jason Maskiell Weight 61.5 CD 61.5 BP 12 Odds 11-1 - 14-1 Trainer K Corstens OHR: 65 Ongoing Winners [o] 00-02-12 Rail True Entire Circuit. (Pent: 5.63). Track Direction Anti-Clockwise Second Reliabelle (57.5) Third The Great Bratski (58) Inrunning Position twelfth on settling, twelfth at 800m, tenth on turn Tempo Suited back makers Video Comment Slow to begin, settled worse than midfield 4WWC 7.75L, 5+WNC midfield 4.25L at the turn, came widest, kept coming, finished strongly to join the leader on the line. 4m21d 21/02/2019 PAKENHAM PARK: Margin 5.6 Distance 1200m SOT G RST 3U BM64 Race Cora Lynn Netball Club (BM64) Prize $35,000 API 0.25 Race Time 1:11.50 Time Adj +1.13 Sec Time 0:35.12 Sec Time Adj +1.48 Jockey Jamie Mott Weight 58.5 CD 58.5 BP 3 Odds 15-2 - 8-1 Trainer K Corstens OHR: 61 Ongoing Winners [o] 01-02-08 Rail Out 3m Entire Circuit. (Pent: 5.11). Track Direction Anti-Clockwise Gear Change Ear Muffs (Pre-Race Only) OFF FIRST TIME, Lugging Bit OFF FIRST TIME Winner Mrs O'malley (56.5) Second Frankel My Dear (58) Third Undoubtable Miss (56.5) Inrunning Position seventh on settling, seventh at 800m, seventh on turn Tempo Suited front runners Video Comment Jumped on terms, drifted back, settled 7th of 8 on the inside 5.75L, improved 7th 2WWC 4.5L at the turn, hard ridden getting off fence straightening up, held ground only. 12d 3/10/2018 BALLARAT: Margin 4.4 Distance 2300m SOT G RST BM64 Race Porter Plant (BM64) Prize $25,000 Race Time 2:27.26 Time Adj +5.16 Sec Time 0:36.06 Sec Time Adj +0.52 Jockey Rose Pearson Weight 59.0 CD 57.0 BP 3 Odds 30-1 25-1 - 30-1 Trainer Leon & Troy Corstens OHR: 61 Ongoing Winners [o] 02-00-08 Rail Out 7m 600m - WP, True Remainder. (Pent: 5.72). Track Direction Anti-Clockwise Stewards Near the 1900m, steadied off the heels of Rakti Roulette. After being bumped outwards by Hifranc rounding the turn near the 400m, steadied when awkwardly placed on the heels of Fastlane To Heaven. Winner Fastlane To Heaven (56.5) Second Ocean Walzer (61) Third San Remo (59.5) Inrunning Position sixth on settling, sixth at 1200m, sixth at 800m, sixth on turn Tempo Suited front runners Video Comment Jumped on terms, settled 6th of 8 2WWC 3.5L, eased from heels near 1900m, 6th at the 800m, 6th 4WWC 3L at the turn, steadied when awkward on heels, battled to the line. 8d 21/09/2018 GEELONG SYNTHETIC: Margin 9.2 Distance 1900m SOT N RST BM64 Race Briseis Club (BM64) Prize $25,000 API 0.81 Race Time 1:56.87 Time Adj +1.07 Jockey Rose Pearson Weight 60.0 CD 58.0 BP 4 Odds 9-4 15-8 - 2-1 EF Trainer Leon & Troy Corstens OHR: 62 Ongoing Winners [o] 00-01-07 Rail True Entire Circuit Track Direction Anti-Clockwise Stewards Settled at the rear. Winner Easy Drama (57) Second Frankiedee (57.5) Third Ennis (54) Inrunning Position seventh on settling, seventh at 1200m, seventh at 800m, sixth on turn Video Comment Jumped on terms, settled inside 7.5L last, with the strong tempo he became detached from the field and still last at the 800m, did some work to be 6th 3WWC 4.5L at the turn, improved position late but never likely. Vet - no abnormality. 3m4d 26/03/2019 GEELONG: Margin 8.6 Distance 1521m SOT G RST BM64 Race Briseis Club Rmbl Invest.-Bm64 Prize $35,000 API 0.68 Race Time 1:32.65 Time Adj +1.95 Sec Time 0:34.26 Sec Time Adj -1.14 Jockey Teodore Nugent Weight 59.5 CD 59.5 BP 5 Odds 13-4 7-2 - 2-1 Trainer C Maher & D Eustace OHR: 63 Ongoing Winners [o] 00-02-04 Rail Out 5m Entire Circuit. (Pent: 5.22). Track Direction Anti-Clockwise Stewards Slow to begin. Winner Sonaree (56) Second Maliseet (58.5) Third Sophie's Revenge (58.5) Inrunning Position sixth on settling, sixth at 1200m, sixth at 800m, fourth on turn Tempo Suited front runners Video Comment Slow to begin, got back, settled 2WWC 4.5L last, went forward wide from 600m, worked into the race 4th 4WNC 2.25L at the turn, had plenty to do but didn't have the legs to do any of it. Vet - no abnormalities. 6d 22/12/2018 NEWCASTLE: Margin 8.9 Distance 2360m SOT G RST 3U BM64 Race Coastline Pools & Spas (BM64) Prize $35,000 Race Time 2:28.53 Time Adj -0.85 Sec Time 0:35.60 Sec Time Adj -0.51 Jockey Louise Day Weight 61.0 CD 58.0 BP 1 Odds 3-1 13-4 - 15-8 Trainer C Maher & D Eustace OHR: 63 Ongoing Winners [o] 00-01-05 Rail Out 11m Entire. Track Direction Clockwise Winner Vihari (56.5) Second Chosen Prince (57) Third Allzin (59) Inrunning Position third on settling, third at 1200m, third at 800m, fourth on turn Tempo Suited front runners Video Comment Jumped on terms and showed speed using the inside gate, settled midfield 2.5L on the inside, 3rd at 1200m and wide, 3rd at 800m, 3WWC midfield 1.75L on the turn, held up behind leaders straightening, only battled when clear 300m. Disappointing. 16d 16/12/2018 HAWKESBURY: Margin 2.5 Distance 2000m SOT S RST 3U CL2 Race Julius Flooring Hcp (C2) Prize $35,000 Race Time 2:03.26 Time Adj -0.84 Sec Time 0:36.36 Sec Time Adj +0.34 Jockey Kathy O'hara Weight 59.0 CD 59.0 BP 1 Odds 10-9 1-1 - 10-9 Trainer C Maher & D Eustace OHR: 64 Ongoing Winners [o] 00-01-06 Rail Out 3m 1300m -W/Post; True Remainder. (Pent: 5.25). Track Direction Clockwise Gear Change Cross-over Nose Band AGAIN Winner Equipped (59) Third Dusk Falls (59) Inrunning Position first on settling, first at 1200m, first at 800m, first on turn Tempo Suited front runners Video Comment Jumped on terms, led by 1L on settling, lead by 800m, led by 1L at the turn, kicked fairly but headed 200m. Held rest at bay. 14d 23/09/2018 COLERAINE: Margin 1.0 Distance 3300m SOT G RST 3U MHDLE Race Rigby Brothers Mdn Hrdl Prize $25,000 API 0.16 Race Time 3:58.96 Time Adj +2.16 Sec Time 0:42.42 Sec Time Adj +5.76 Jockey S Jackson Weight 68.5 CD 68.5 BP 5 Odds 15-4 - 13-4 Trainer Peter Gelagotis OHR: 63 Ongoing Winners [o] 00-01-05 Rail True Entire Circuit. (Pent: 5.39). Track Direction Anti-Clockwise Stewards Checked early on. Winner Sweet Lullaby (66.5) Third Zoffman (68.5) Inrunning Position third on settling, second at 1200m, second at 800m, first on turn Tempo Suited front runners Video Comment Fast into stride, checked to avoid fallen rider on negotiating 3rd obstacle, settled 3rd of 7 2WWC 2.5L, 2nd at the 800m, led by 1L at the turn, kicked and went to the rail, ran well but couldn't hold off challenger in the shadows. 42d 22/08/2018 SANDOWN-LAKESIDE: Margin 5.7 Distance 2100m SOT S RST BM64 Race Clanbrooke Racing (BM64) Prize $40,000 API 0.98 Race Time 2:14.24 Time Adj +1.04 Sec Time 0:36.57 Sec Time Adj +1.49 Jockey Lachlan King Weight 60.5 CD 57.5 BP 8 Odds 50-1 - 40-1 Trainer Peter Gelagotis OHR: 65 Ongoing Winners [o] 01-02-14 Rail Out 3m Entire Circuit. Track Direction Anti-Clockwise Winner Truly High (58) Second Harvard (61.5) Third Ayers Rock (58.5) Inrunning Position second on settling, second at 1200m, second at 800m, second on turn Tempo Suited front runners Video Comment Jumped on terms, pushed forward, settled on-pace 1L on inside, held position 2WNC on-pace 3/4L at the turn, stayed there until 200m, got the staggers, couldn't finish it off. 18d 24/03/2019 BALLARAT: Margin 1.2 Distance 1400m SOT G RST BM64 Race Hygain Winner's Choice (BM64) Prize $35,000 API 0.94 Race Time 1:26.20 Time Adj +2.8 Sec Time 0:35.98 Sec Time Adj +1.48 Jockey Dean Holland Weight 58.5 CD 58.5 BP 11 Odds 13-2 - 8-1 Trainer Anthony Cosgriff OHR: 62 Ongoing Winners [o] 01-02-11 Rail Out 5m 600m - WP, True Remainder. (Pent: 5.41). Track Direction Anti-Clockwise Stewards Approaching the 200m, shifted inwards and taken Cant Remember inwards. Winner Truly A Star (55) Second Candescence (59) Third Maigret (56.5) Inrunning Position seventh on settling, seventh at 800m, seventh on turn Tempo Suited front runners Video Comment Jumped on terms, settled midfield 3WWC 4.5L, 5WNC midfield 2.75L at the turn, came widest, shifted inward near the 200m, looked good for a place entering the final 100m, others fin ished better. 13d 6/03/2019 BENDIGO: Margin 0.1 Distance 1500m SOT G RST 3 MDN Race No Fuss Event Hire 3Yo Mdn Prize $35,000 API 1.12 Race Time 1:31.50 Time Adj +2.94 Sec Time 36.14 Sec Time Adj +1.87 Jockey Dean Holland Weight 58.0 CD 58.0 BP 1 Odds 9-2 7-2 - 4-1 Trainer Anthony Cosgriff OHR: 62 Ongoing Winners [o] 03-01-10 Rail Out 4m Entire Circuit. (Pent: 5.43). Track Direction Anti-Clockwise Stewards Jumped away awkwardly. Second Taxi (58) Third Buffalo Bill (58) Inrunning Position fourth on settling, fourth at 1200m, fourth at 800m, fifth on turn Tempo Suited front runners Video Comment Jumped away awkwardly, settled 4th of 9 on the inside 1.5L, 5th inside 1.75L at the turn, got dream run on fence when leader rolled off straightening, burst through and took over, challenged late but had enough in hand to hold on and win. 15d 6/02/2019 ARARAT: Margin 1.5 Distance 1300m SOT G RST 3 MDN Race Tac Be Race Ready Mdn Plate Prize $23,000 API 2.5 Race Time 1:16.79 Time Adj +1.49 Sec Time 0:35.09 Sec Time Adj +1.02 Jockey Damien Thornton Weight 58.0 CD 58.0 BP 13 Odds 10-1 - 12-1 Trainer Anthony Cosgriff OHR: 0 Ongoing Winners [o] 01-04-11 Rail True Entire Circuit. (Pent: 5.2). Track Direction Anti-Clockwise Stewards Raced wide, without cover, throughout. Winner Nordic Symphony (56) Third Dee Jay Artie (58) Inrunning Position third on settling, third at 800m, third on turn Tempo Suited front runners Video Comment Fast into stride, settled on-pace 3WNC 1.25L, 3WNC on-pace 2L at the turn, chased hard all the way to get in behind the winner. Raced wide, without cover throughout. 6 of 11 22/01/2019 WARRNAMBOOL: Margin 3.2 Distance 1400m SOT G RST 3 MDN Race Bowman Financial Services Mdn Prize $35,000 API 4.14 Race Time 1:24.30 Time Adj +2.05 Sec Time 36.06 Sec Time Adj +1.85 Jockey Jordan Childs Weight 58.0 CD 58.0 BP 4 Odds 9-1 20-1 - 20-1 Trainer Anthony Cosgriff OHR: 0 Ongoing Winners [o] 01-03-08 Rail Out 9m Entire Circuit. (Pent: 5.58). Track Direction Anti-Clockwise Winner Boomstock (58) Second Agente Fiscale (58) Third Ninth Avenue (56) Inrunning Position first on settling, first at 800m, first on turn Tempo No bias Video Comment Jumped on terms, drove forward and led by 1/4L on settling, led by 1/2L at the turn, headed at the 200m, fought well to the 75m, swamped as effort levelled off. 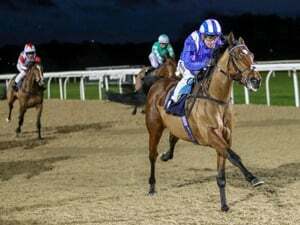 19d 3/04/2019 SANDOWN-LAKESIDE: Margin 3 Distance 1400m SOT G RST 3 BM64 Race The Big Screen Company (BM64) Prize $50,000 API 0.63 Race Time 1:25.69 Time Adj +2.89 Sec Time 0:33.91 Sec Time Adj +0.41 Jockey Patrick Moloney Weight 59.0 CD 59.0 BP 1 Odds 40-1 - 60-1 Trainer John Moloney OHR: 61 Ongoing Winners [o] 02-00-03 Rail Out 6m Entire Circuit. Track Direction Anti-Clockwise Stewards Raced in restricted room over the final 100m. Winner Big Night Out (59) Second Shandy (57) Third Analytica (59.5) Inrunning Position fourth on settling, fourth at 800m, fourth on turn Tempo Suited front runners Video Comment Jumped on terms, drifted back, settled on-pace 2.25L on inside, 2WWC on-pace 1.25L at the turn, held up behind leaders straightening, did not get much room in straight, prepared to forgive run. 4m12d 27/02/2019 SANDOWN-HILLSIDE: Margin 1.7 Distance 1300m SOT G RST 3 MDN Race Le Pine Funerals Mdn Plate Prize $50,000 API 0.8 Race Time 1:18.53 Time Adj +2.35 Sec Time 0:34.95 Sec Time Adj +0.95 Jockey Patrick Moloney Weight 58.0 CD 58.0 BP 2 Odds 12-1 - 20-1 Trainer John Moloney OHR: 0 Ongoing Winners [o] 02-04-13 Rail Out 12m Entire Circuit. Track Direction Anti-Clockwise Stewards Eased approaching the winning post to avoid the heels of Duke of Magnus. Winner Eighteen Carrot (58) Second Charitable Nature (56) Third Secretly Discreet (56) Inrunning Position fourth on settling, fifth on turn Tempo Suited front runners Video Comment Jumped on terms, settled 4th of 9 2WWC 1.75L, 5th 2WWC 1.5L at the turn, ridden along from the corner, did not get much room last 200m and not far away, eased off heels at the finish. 4m3d 3/04/2019 SANDOWN-LAKESIDE: Margin 8.4 Distance 1400m SOT G RST 3 BM64 Race The Big Screen Company (BM64) Prize $50,000 API 0.63 Race Time 1:25.69 Time Adj +2.89 Sec Time 0:33.91 Sec Time Adj +0.41 Jockey Damian Lane Weight 59.0 CD 59.0 BP 11 Odds 30-1 - 40-1 Trainer Chris Waller OHR: 61 Ongoing Winners [o] 02-00-03 Rail Out 6m Entire Circuit. Track Direction Anti-Clockwise Gear Change Blinkers FIRST TIME Stewards Jumped away awkwardly and then shortly after had to be checked away from the heels of Ocean Essence. Approaching the 500m, when laying out, shifted out across the heels of Big Night Out. Winner Big Night Out (59) Second Shandy (57) Third Analytica (59.5) Inrunning Position eleventh on settling, tenth at 800m, eleventh on turn Tempo Suited front runners Video Comment Jumped away awkwardly, settled worse than midfield 7.5L on inside, laid out and off heels 500m, 4WWC worse than midfield 6L at the turn, came off heels straightening up, did nothing. 14d 1/12/2018 KEMBLA GRANGE: Margin 0.2 Distance 1400m SOT S RST MDN Race The April-Maree Mdn Hcp Prize $35,000 API 0.02 Race Time 1:24.81 Time Adj +0.91 Sec Time 0:36.40 Sec Time Adj +1.91 Jockey Lee Magorrian Weight 55.5 CD 55.5 BP 4 Odds 13-2 15-2 - 13-2 Trainer Chris Waller OHR: 62 Ongoing Winners [o] 01-01-08 Rail True. Track Direction Clockwise Stewards Near the 1150m, had to be eased from the heels of Winspear. Near the 1100m, shifted in when insufficiently clear of Seau. Second Winspear (54) Third Noble House (55.5) Inrunning Position fifth on settling, sixth at 800m, sixth on turn Tempo No bias Video Comment Jumped on terms, had to be eased from heels 1150m, shifted in when insufficiently clear of runner 1100m, settled midfield 2WWC 5.25L, 4WNC midfield 3L on the turn, presented out wide straightening, chased hard, out-slogged them in a narrow win. 21d 17/11/2018 KEMBLA GRANGE: Margin 2.8 Distance 1500m SOT H RST MDN Race Rotary Club Mdn Hcp Prize $35,000 Race Time 1:34.40 Time Adj +1.7 Sec Time 0:35.48 Sec Time Adj +0.86 Jockey Mitchell Bell Weight 56.5 CD 56.5 BP 1 Odds 8-1 9-1 - 7-1 Trainer Chris Waller OHR: 0 Ongoing Winners [o] 05-01-14 Rail Out 6m 1100m to WP. Out 4m Remainder. Track Direction Clockwise Gear Change Nose Roll FIRST TIME Winner Miss Jenny (57) Second I Arize (57.5) Third Point Of Honour (59) Inrunning Position fourth on settling, fourth at 800m, fourth on turn Tempo Suited front runners Video Comment Jumped on terms, settled midfield 5.25L on the inside, stayed inside midfield 2.25L on the turn, behind leader straightening, got clear 375m, ground away to the line. 11 of 11 27/10/2018 KEMBLA GRANGE: Margin 10.6 Distance 1200m SOT G RST CG MDN Race Cbc Storage Group Mdn Plate Prize $35,000 API 4.02 Race Time 1:10.01 Time Adj +0.76 Sec Time 0:34.31 Sec Time Adj +0.98 Jockey Craig Franklin Weight 56.5 CD 56.5 BP 6 Odds 20-1 - 30-1 Trainer Chris Waller OHR: 0 Ongoing Winners [o] 05-02-13 Rail True. Track Direction Clockwise Gear Change Lugging Bit FIRST TIME, Tongue Tie FIRST TIME Stewards Approaching the 1000m, when racing greenly, shifted in and away from Valiant and had to be steadied. Winner Baller (56.5) Second Bentley Magic (54.5) Third Zeppelin (59) Inrunning Position eleventh on settling, eleventh at 800m, eleventh on turn Tempo Suited front runners Video Comment Jumped slowly, settled last 6+L, approaching the 1000m when racing greenly shifted in and away from runner and had to be steadied, 6+L last on the turn, clear last straightening, laboured under pressure, did nothing. Vet-no abnormalities. 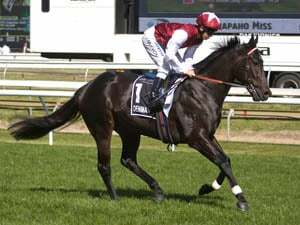 6m22d 29/03/2019 WARRNAMBOOL: Margin 2.8 Distance 1700m SOT S RST 3U BM58 Race Cri-Tech Plumbing (BM58) Prize $22,000 API 7.25 Race Time 1:47.33 Time Adj +2.73 Sec Time 39.6 Sec Time Adj +4.32 Jockey Liam Riordan Weight 61.0 CD 61.0 BP 12 Odds 10-1 - 11-1 Trainer Mitchell Freedman OHR: 60 Ongoing Winners [o] 00-03-07 Rail Out 4m Entire Circuit. (Pent: 5.25). Track Direction Anti-Clockwise Gear Change Blinkers OFF AGAIN, Gelded Stewards Restrained from the start. Winner Hard 'n' Tough (56.5) Second Answered (58) Third Harvard (62.5) Inrunning Position twelfth on settling, twelfth at 1200m, twelfth at 800m, tenth on turn Tempo Suited back makers Video Comment Jumped on terms, out the back, settled 2WWC 7L last, last at the 800m but wide, 4WWC midfield 3L at the turn, commenced to improve on the corner, went back to inside and finished strongly but from too far back. 17d 8/09/2018 KILMORE: Margin 5.8 Distance 1900m SOT S RST BM64 Race Epping Plaza Hotel (BM64) Prize $20,000 API 0.77 Race Time 2:03.48 Time Adj +2.68 Sec Time 37.19 Sec Time Adj +0.97 Jockey Jarrod Lorensini Weight 58.5 CD 58.5 BP 10 Odds 2-1 5-2 - 5-2 Trainer Darren Weir OHR: 60 Ongoing Winners [o] 01-03-09 Rail True Entire Circuit. (Pent: 6.37). Track Direction Anti-Clockwise Stewards When over-racing near the 1600m was steadied off the heels of Pachino Boy. Raced wide without cover before gaining cover near the 900m. Winner The Thug (59.5) Second Rex Bell (58.5) Third Knight Star (58.5) Inrunning Position ninth on settling, ninth at 1200m, eighth at 800m, eighth on turn Tempo Suited front runners Video Comment Jumped on terms, settled worse than midfield 3WWC 5.5L, steadied off heels when over-racing near the 1600m, gained cover near the 900m, 8th at 800m but wide, 4WWC midfield 2.75L at the turn, battled along, made no impression. Vet- no abnormalities. 23d 22/08/2018 SANDOWN-LAKESIDE: Margin 2.3 Distance 1600m SOT S RST 3U MDN Race Polytrack Mdn Plate Prize $30,000 API 51.59 Race Time 1:40.70 Time Adj +2.2 Sec Time 0:34.84 Sec Time Adj +0.52 Jockey Brad Rawiller Weight 58.5 CD 58.5 BP 9 Odds 5-2 5-2 - 11-4 Trainer Darren Weir OHR: 61 Ongoing Winners [o] 01-02-11 Rail Out 3m Entire Circuit. Track Direction Anti-Clockwise Gear Change Blinkers AGAIN Second Maclairey (58.5) Third Reposition (58.5) Inrunning Position second on settling, second at 1200m, second at 800m, second on turn Tempo Suited front runners Video Comment Fast into stride, settled 2nd 2WNC on-pace 1L, 2WNC on-pace 1/4L at the turn, took over near the 300m, kicked clear at the 200m, proved far too good. 48d 30/07/2018 DONALD: Margin 1.3 Distance 1620m SOT S RST 2U MDN Race Weir's Iga Donald Mdn Plate Prize $22,000 API 0.52 Race Time 1:43.88 Time Adj +3.18 Sec Time 0:36.43 Sec Time Adj +0.14 Jockey Dean Yendall Weight 58.5 CD 58.5 BP 10 Odds 5-1 - 9-2 Trainer Darren Weir OHR: 0 Ongoing Winners [o] 02-01-14 Rail Out 2m Entire Circuit. (Pent: 5.99). Track Direction Anti-Clockwise Gear Change Blinkers OFF FIRST TIME Stewards Raced wide, without cover, for the majority of the event. Winner Baby (56) Third Pressure (54) Inrunning Position seventh on settling, fifth at 1200m, fifth at 800m, second on turn Tempo Suited front runners Video Comment Jumped on terms, restrained from outside to be 7th 4.75L on settling, 5th at 800m, improved to be 2nd 5WNC 1L on the turn, went to the outside rail straightening up, tried hard but couldn't reel in the winner. 5m 12/06/2018 PAKENHAM PARK SYNTHETIC: Margin 7.6 Distance 1400m SOT N RST 3 MDN Race Racing.Com Mdn Plate Prize $22,000 API 0.82 Race Time 1:26.86 Time Adj +1.46 Jockey Michelle Payne Weight 58.0 CD 58.0 BP 7 Odds 20-1 - 40-1 Trainer Michelle Payne OHR: 0 Ongoing Winners [o] 00-02-09 Rail True Entire Circuit. Track Direction Anti-Clockwise Stewards Eased down inside the final 100 metres. Winner So You Dream (58) Second Smurf Cody (56) Third Mercury Bullet (58) Inrunning Position first on settling, first at 800m, second on turn Video Comment Jumped on terms, worked over to lead on settling, led at 800m, 2nd along the rail 1/4L on the turn, did not respond to riding. Eased down final 100m. 27d 15/11/2018 PAKENHAM PARK: Margin 0.8 Distance 2000m SOT S RST 3U MDN Race Evergreen Turf Super Mdn Plate Prize $27,000 API 1.19 Race Time 2:06.47 Time Adj +0.47 Jockey Dylan Dunn Weight 57.0 CD 57.0 BP 5 Odds 13-4 - 9-4 Trainer Jamie Edwards OHR: 61 Ongoing Winners [o] 00-02-06 Rail Out 6m Entire Circuit. (Pent: 6.18). Track Direction Anti-Clockwise Second City Chap (58.5) Third Honour Pendragon (58.5) Inrunning Position fourth on settling, fourth at 1200m, fourth at 800m, fourth on turn Video Comment Jumped on terms, not bustled, settled 4th of 8 2WWC 4L, 4th at the 800m, 4th 3WNC 1.75L at the turn, came off heels to chase, hit the front inside 200m, found a late challenge but dug deep to edge away for a gutsy win. 4m1d 5/10/2018 KYNETON: Margin 1.1 Distance 1450m SOT G RST 3U MDN Race Ray White Real Est. Romsey Mdn Prize $23,000 Race Time 1:28.62 Time Adj +2.53 Sec Time 36.58 Sec Time Adj +2.65 Jockey Craig Robertson Weight 56.0 CD 56.0 BP 7 Odds 30-1 - 60-1 Trainer Jamie Edwards OHR: 0 Ongoing Winners [o] 01-03-09 Rail True Entire Circuit. (Pent: 6.15). Track Direction Anti-Clockwise Gear Change Cheekers FIRST TIME Stewards Passing the 1000m, bumped with Zoology and became unbalanced. Winner Smokin' Pierro (58.5) Second Zoology (58.5) Inrunning Position second on settling, second at 800m, second on turn Tempo No bias Video Comment Jumped on terms, pushed up from outside, settled on-pace 2WNC 1.5L, joint leader 3W 1/4L at the turn, took over 200m and looked good for the money but nabbed late. 11 of 13 6/06/2018 SANDOWN-LAKESIDE: Margin 13.9 Distance 1400m SOT G RST 2 OPEN Race Clanbrooke Racing Hcp Prize $35,000 API 1.3 Race Time 1:23.96 Time Adj +0.76 Sec Time 0:34.50 Sec Time Adj +0.92 Jockey Craig Williams Weight 58.0 CD 58.0 BP 12 Odds 25-1 20-1 - 25-1 Trainer Jamie Edwards OHR: 0 Ongoing Winners [o] 01-00-05 Rail Out 9m Entire Circuit. Track Direction Anti-Clockwise Stewards Contacted at the start. Winner Fighting Harada (58.5) Second Zoutori (59) Third Real Success (59) Inrunning Position eleventh on settling, tenth at 800m, thirteenth on turn Tempo Suited front runners Video Comment Contacted at the start, reined in to be 11th 3WWC 3.25L on settling, 10th at 800m, last 3WWC 4.5L on the turn, passed a few tired ones. 81d 23/03/2019 MORNINGTON: Margin 5.4 Distance 1200m SOT G RST 3U FM BM70 Race Cleanaway (BM70) Prize $75,000 Race Time 1:10.55 Time Adj +1.06 Sec Time 34.86 Sec Time Adj +1.16 Jockey Jack Martin Weight 57.0 CD 55.0 BP 9 Odds 30-1 - 40-1 Trainer Jarrod Robinson OHR: 64 Ongoing Winners [o] 02-03-10 Rail True Entire Circuit. Track Direction Anti-Clockwise Winner Tahitian Dancer (58) Second Music Bay (56) Third Northern River (57) Inrunning Position ninth on settling, ninth on turn Tempo Suited front runners Video Comment Jumped fairly, restrained, settled worse than midfield 3WWC 6L, 5+WNC 6L last at the turn, well back before picked up the bit and finished well. 17d 1/01/2019 FLEMINGTON: Margin 3.6 Distance 1800m SOT G RST 34 BM70 Race Vale John Marshall Trophy-Bm70 Prize $135,000 API 0.91 Race Time 1:51.15 Time Adj +2.66 Sec Time 0:33.87 Sec Time Adj -1.45 Jockey Jack Martin Weight 55.0 CD 55.0 BP 5 Odds 4-1 - 5-1 Trainer Jarrod Robinson OHR: 64 Ongoing Winners [o] 01-01-04 Rail Out 3m Entire Circuit. Track Direction Anti-Clockwise Stewards Failed to handle going. Vetted - no abnormalities. Winner Five Kingdom (58) Second Box On Collins (57) Third Phoneme (57.5) Inrunning Position seventh on settling, seventh at 800m, fifth on turn Tempo Suited front runners Video Comment Jumped fairly, settled 7th of 8 2WWC 6L, 7th at the 800m but wide, 5th 4WNC 1.5L at the turn, boxed on evenly, never threatened. Vet-no abnormalities. 14d 15/12/2018 FLEMINGTON: Margin 1.0 Distance 1720m SOT S RST 34 BM70 Race Vrc Schools Program (BM70) Prize $120,000 API 0.54 Race Time 1:45.88 Time Adj +0.28 Sec Time 0:35.60 Sec Time Adj -1.10 Jockey Damien Thornton Weight 54.0 CD 54.0 BP 7 Odds 20-1 14-1 - 15-1 Trainer Jarrod Robinson OHR: 64 Ongoing Winners [o] 02-01-08 Rail Out 10m Entire Circuit. Track Direction Anti-Clockwise Gear Change Cheekers FIRST TIME, Lugging Bit OFF FIRST TIME, Standard Bit FIRST TIME Winner Declares War (57) Third Five Kingdom (58) Inrunning Position eleventh on settling, eighth at 800m, eighth on turn Tempo Suited front runners Video Comment Jumped fairly, drifted back, settled midfield, 6L on inside, 8th at the 800m, moved up 4WWC midfield 2.75L at the turn, worked to middle track from the corner, took over 200m and looked winner but just found one better final stages. 7m21d 1/12/2018 MOONEE VALLEY: Margin 5.1 Distance 1500m SOT G RST BM64 Race Inglis Catalogues Out Now-Bm64 Prize $60,000 Race Time 1:30.78 Time Adj +0.79 Sec Time 0:35.89 Sec Time Adj +1.21 Jockey Jack Martin Weight 57.0 CD 55.0 BP 5 Odds 20-1 30-1 - 25-1 Trainer Jarrod Robinson OHR: 62 Ongoing Winners [o] 04-08-21 Rail True Entire Circuit. (Pent: 4.65). Track Direction Anti-Clockwise Gear Change Blinkers OFF FIRST TIME, Ear Muffs (Pre-Race Only) FIRST TIME, Lugging Bit FIRST TIME Stewards Over-raced in the early stages, getting its head in the air on several occasions. Laid outwards rounding the home turn and was then held up for clear running until near the 100m. Winner Five Kingdom (58.5) Second Tanto Bianco (59) Third Hostar (59) Inrunning Position eleventh on settling, eleventh at 800m, ninth on turn Tempo Suited front runners Video Comment Jumped fairly, settled worse than midfield 2WWC 6.5L, inside midfield 3.5L at the turn, between horses, held up, good when clear. 17d 14/04/2018 RANDWICK: Margin 25.9 Distance 2400m SOT G RST 3 F OPEN G1 Group G1 Race Australian Oaks Prize $1,114,500 API 0.5 Race Time 2:27.21 Time Adj -1.98 Sec Time 0:36.10 Sec Time Adj +0.69 Jockey Rhys Mcleod Weight 56.0 CD 56.0 BP 10 Odds 60-1 - 150-1 Trainer Nigel Blackiston OHR: 62 Ongoing Winners [o] 00-01-04 Rail Out 3m Entire Circuit. (Pent: 5.11). Track Direction Clockwise Stewards Raced keenly in the middle stages. Near the 1800m checked, losing its rightful running. Winner Unforgotten (56) Second Hiyaam (56) Third Miss Admiration (56) Inrunning Position eighth on settling, eighth at 1200m, ninth at 800m, ninth on turn Tempo Suited front runners Video Comment Jumped fair to be 9th 2WWC 6+L on settling, raced keenly middle stages, near the 1800m checked, losing its rightful running 9th at 800m, last 4WNC 6+L on the turn, failed to pass one in the straight. Tailed off badly. 47d 7/03/2019 PAKENHAM PARK: Margin 4.9 Distance 1600m SOT G RST BM64 Race Palace Hotel Lang Lang (BM64) Prize $35,000 API 0.47 Race Time 1:40.19 Time Adj +3.5 Sec Time 36.56 Sec Time Adj +2.50 Jockey Damien Thornton Weight 57.0 CD 57.0 BP 5 Odds 6-1 7-1 - 6-1 Trainer Mathew Ellerton & Simon Zahra OHR: 62 Ongoing Winners [o] 01-05-11 Rail Out 9m Entire Circuit. (Pent: 5.55). Track Direction Anti-Clockwise Stewards Vetted - no abnormalities. Winner Jungle Fish (60.5) Second Melody Calling (56) Third Savvy Oak (60.5) Inrunning Position first on settling, second at 1200m, second at 800m, first on turn Tempo Suited front runners Video Comment Fast into stride, led by 1/2L on settling, led by 2W 1/4L at the turn, under siege on both flanks, quickly headed, stayed on to the 150m, faded. Vet - no abnormalities. 20d 19/01/2019 FLEMINGTON: Margin 3.1 Distance 2000m SOT G RST 3 BM70 Race Flemington Event Staff (BM70) Prize $135,000 API 2.49 Race Time 2:05.67 Time Adj +4.24 Sec Time 0:34.34 Sec Time Adj -0.99 Jockey Damian Lane Weight 55.5 CD 55.5 BP 3 Odds 13-2 8-1 - 6-1 Trainer Mathew Ellerton & Simon Zahra OHR: 63 Ongoing Winners [o] 00-00-06 Rail Out 9m Entire Circuit. Track Direction Anti-Clockwise Winner Oceanex (57) Second Royal Performance (58.5) Inrunning Position third on settling, third at 800m, fifth on turn Tempo Suited front runners Video Comment Jumped on terms, moved up quickly, settled on-pace 1.25L on inside, 3rd at the 800m, 2WWC midfield 1.5L at the turn, chased steadily to the 100m, quickened late and grabbed the minor placing. 9d 30/12/2018 SEYMOUR: Margin 2.8 Distance 1600m SOT S RST 3U FM MDN Race Avenel Equine Hospital Mdn Prize $26,000 API 1 Race Time 1:37.20 Time Adj -1.1 Sec Time 35.3 Sec Time Adj -0.80 Jockey Damien Thornton Weight 56.5 CD 56.5 BP 5 Odds 2-1 - 2-1 EF Trainer Mathew Ellerton & Simon Zahra OHR: 61 Ongoing Winners [o] 00-05-11 Rail True Entire Circuit. (Pent: 4.98). Track Direction Anti-Clockwise Stewards Lay inwards under pressure in the straight. Second Arfurized (58) Third Sergeant Doyle (56.5) Inrunning Position second on settling, third at 1200m, fourth at 800m, third on turn Tempo Suited front runners Video Comment Jumped on terms, went forward, settled on-pace 2WNC 3/4L, fanned out 4WNC on-pace 1L at the turn, hit the front inside 250m, ran away from them last 100m for a commanding win. 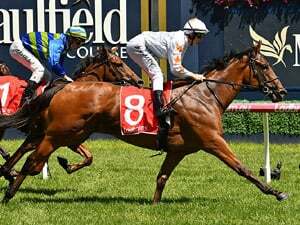 21d 21/12/2018 MOONEE VALLEY: Margin 5.2 Distance 1600m SOT S RST 3U MDN Race Salt&Pepper Homewares Mdn Prize $30,000 API 0.59 Race Time 1:41.17 Time Adj +3.37 Sec Time 0:37.79 Sec Time Adj +1.41 Jockey Craig Williams Weight 55.0 CD 55.0 BP 5 Odds 9-2 - 11-2 Trainer Mathew Ellerton & Simon Zahra OHR: 0 Ongoing Winners [o] 03-06-13 Rail True Entire Circuit. (Pent: 4.59). Track Direction Anti-Clockwise Stewards Raced keenly with its head in the air in the early stages. Winner Dalmatia (55) Second Scherzer (54) Third North Afrika (56.5) Inrunning Position fifth on settling, sixth at 1200m, sixth at 800m, fourth on turn Tempo No bias Video Comment Jumped fairly, raced keenly with head up settled midfield 2WWC 4L, 3WWC midfield 2.25L at the turn, battled well without troubling the leading runners. Vet-no abnormalities. 4m12d 30/11/2018 CRANBOURNE: Margin 0.9 Distance 1400m SOT G RST 3 F MDN Race Mercedes-Benz Mornington Mdn Prize $27,000 API 5.97 Race Time 1:24.88 Time Adj +1.69 Jockey Damien Thornton Weight 57.0 CD 57.0 BP 4 Odds 6-4 - 15-8 Trainer Mathew Ellerton & Simon Zahra OHR: 0 Ongoing Winners [o] 01-02-09 Rail Out 9m Entire Circuit. (Pent: 5.3). Track Direction Anti-Clockwise Stewards Near the 300 metres, bumped on two occasions by Rock Dove and after being shifted out slightly away from Gemrocks. Winner Rock Dove (57) Second Caravan (57) Inrunning Position third on settling, third at 800m, third on turn Video Comment Jumped on terms, settled 3rd of 7 on the inside 1L, 3rd 4WNC 1/4L at the turn, even effort home. 22d 7/03/2019 PAKENHAM PARK: Margin 0.3 Distance 1600m SOT G RST BM64 Race Palace Hotel Lang Lang (BM64) Prize $35,000 API 0.47 Race Time 1:40.19 Time Adj +3.5 Sec Time 36.56 Sec Time Adj +2.50 Jockey J Allen Weight 56.0 CD 56.0 BP 7 Odds 30-1 40-1 - 20-1 Trainer Matt Cumani OHR: 61 Ongoing Winners [o] 01-05-11 Rail Out 9m Entire Circuit. (Pent: 5.55). Track Direction Anti-Clockwise Stewards Led. Winner Jungle Fish (60.5) Third Savvy Oak (60.5) Inrunning Position second on settling, first at 1200m, first at 800m, second on turn Tempo Suited front runners Video Comment Jumped on terms, strode forward, settled 2nd of 8 4WNC 1/2L, 2nd inside 1/4L at the turn, disputed the lead on straightening, slugged it out with another from the 150m, conceded late. 20d 13/02/2019 SANDOWN-HILLSIDE: Margin 6.2 Distance 1800m SOT G RST BM64 Race Blue Star Print (BM64) Prize $50,000 API 0.73 Race Time 1:51.46 Time Adj +2.94 Sec Time 0:35.81 Sec Time Adj +0.55 Jockey Dean Holland Weight 56.5 CD 56.5 BP 15 Odds 66-1 - 80-1 Trainer Matt Cumani OHR: 60 Ongoing Winners [o] 03-03-16 Rail Out 6m Entire Circuit. Track Direction Anti-Clockwise Stewards Raced wide in the early stages before being permitted to stride forward to take up a position outside the lead near the 1000m. Winner Jungle Fish (58) Second La Belle Jude (56) Third Longclaw (58) Inrunning Position sixth on settling, second at 1200m, second at 800m, first on turn Tempo Suited front runners Video Comment Jumped on terms, went forward wide early stages, settled midfield 5WNC 1.75L, worked hard to get outside leader, 2nd at the 800m, led by 2W 1/4L at the turn, under pressure soon after straightening, weakened last 200m. 18d 24/01/2019 PAKENHAM PARK: Margin 0.1 Distance 1600m SOT G RST 4U MDN Race Racing.Com Mdn Plate Prize $35,000 API 0.99 Race Time 1:37.79 Time Adj +1.02 Sec Time 35.48 Sec Time Adj +1.42 Jockey Dean Holland Weight 56.5 CD 56.5 BP 2 Odds 2-1 - 9-4 Trainer Matt Cumani OHR: 61 Ongoing Winners [o] 00-03-08 Rail Out 3m Entire Circuit. (Pent: 5.43). Track Direction Anti-Clockwise Stewards Lay out for a short distance rounding the first turn. Had some difficulty obtaining a clear run in the early part of the straight. Shifted out under pressure in the straight. Shifted out under pressure over the final 150 metres resulting in Too Much Lip being carried slightly wider. Second Creative Harmony (58.5) Third Too Much Lip (58.5) Inrunning Position fourth on settling, third at 1200m, third at 800m, third on turn Tempo Suited front runners Video Comment Jumped fairly, not bustled and settled 4th of 8 on the inside 1.5L, 5th at the turn on the inside 1L, held up early part of straight then charged up and took over 150m, wanted to hang out but gave all and just fell in. 10m 6/01/2019 WARRNAMBOOL: Margin 2.2 Distance 1400m SOT G RST 3U FM MDN Race Matko Hire Mdn Plate Prize $35,000 API 0.84 Race Time 1:25.40 Time Adj +3.4 Sec Time 36.14 Sec Time Adj +1.93 Jockey Dean Holland Weight 58.0 CD 58.0 BP 10 Odds 9-2 7-1 - 5-2 Trainer Matt Cumani OHR: 0 Ongoing Winners [o] 02-03-14 Rail Out 6m Entire Circuit. (Pent: 5.61). Track Direction Anti-Clockwise Stewards Over-raced through the early stages. Winner Daisley (58) Second River Mist (56.5) Third Raffine (58) Inrunning Position ninth on settling, ninth at 800m, fifth on turn Tempo Suited front runners Video Comment Jumped fairly, over-raced, settled midfield 3WWC 4.5L, 5WNC on-pace 2.5L at the turn, worked home well without threatening.